Process. Ministry of autonomies ensures that the document served to improve the development of autonomy. The “accursed law”. 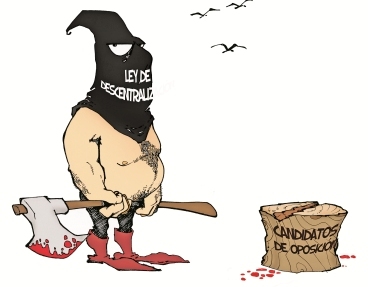 So called, by the central government opponents to the framework law of autonomies that already served two years in duration, and with its articles, it has overthrown eleven elected Mayors by the popular vote in all the national territory, plus Governors of the Department of Beni, Ernesto Suárez and Tarija, Mario Cossio. It should be noted that with this law, seven Councillors of the municipality of Santa Cruz have recently been suspended. This path can also follow Santa Cruz Governor, Ruben Costas. Article 144 of the framework law of autonomies, establishes that Governors and Mayors, top regional executive authority, assemblymen, departmental and regional, councillors and aldermen of the autonomous territorial entities, may be suspended temporarily in the exercise of their Office against Formal accusation, and under this point several elected officials were suspended. ‘They released it’. The first to fall were the mayors of the capital municipalities, Jaime Barron of Sucre and from Potosí, Rene Joaquino, both suspended shortly after the framework law was promulgated by the President Evo Morales, July 19, 2010. Barron stepped down after weeks of having been elected, accused of being responsible for alleged abuse to peasants on May 24, 2008. For the suspended authority, the law framework of autonomy, which celebrates two years in force, is an unconstitutional rule which violates the rights of persons, such was his case. Besides Joaquino and Barron, Mayors who were taken away from their posts are: Nils Carmona from Warnes, Vladimir Chávez from Buena Vista, Jorge Morales from La Guardia, Roger Terceros from Mairana, Carlos Velarde from San Matías, Delfor Burgos from Bermejo, Victor Balderrama from Punata, David Carvajal from San Buenaventura and Hector Cartagena from Quillacollo, all opposition and spoofed by authorities, militants of the movement toward socialism (MAS). Controversial suspension. Finally we can mention the controversial suspension of seven crucians’ Councillors that occurred this week, under articles 144 and 145 of the framework law of autonomies. For Mayor Leonardo Roca, one of those affected, standard searches for ‘beheading’ opponents. “In my opinion, and particularly touching the case of the municipality of Santa Cruz, here must take precedence the principle of innocence until found otherwise.” “Here is generating jurisprudence”, said Roca. Contribution to the autonomy law. Despite criticism against the law under autonomies and articles 144 and 145 in specific, the Autonomies Minister, Claudia Peña, stressed that this standard has contributed greatly to the development of autonomy, the realization of the organic letters and autonomy statutes, which is also the definition of government machinery spaces. “I’m in disagreement, they may not look at two articles to a law that has more than 100 articles that benefit society.” “The opposition emphasizes this point because there it is guilty of embezzlement, this law only seeks to control and prevent the deficiencies that exist in several municipalities of the country,” mentioned the ministerial authority, at time of challenging opponents, why now are they critical to the framework law of autonomies, when the municipalities Law has similar characteristics. Possible modifications. The Deputy of the opposition party, National Convergence (CN), Tomas Monasterios, said to have submitted a draft amendment to the framework law, to try to repeal articles 144 and 145 of this rule laying down the suspensions of elected officials. “We are really concerned because they want to enter through the window, what they did not win to come through the door.” “Our proposal is inside the plurinational Legislative Assembly and we hope that as quickly as possible will be taken into account,” added Monasterios parliamentary. Article 144 (Temporary Suspension). Governors and Mayors, top regional executive authority, assemblymen, departmental and regional councillors may be suspended on a temporary basis in the exercise of their Office when an indictment is handed down against them. Article 28. (Political rights). The exercise of political rights is suspended in the following cases, prior enforceable sentence while the penalty has not been fulfilled: 1) for taking weapons and serve in enemy armed forces, in times of war; (2) by fraud of public resources; (and 3) for treason. Article 6. The Governor, Lieutenant Governor, or departmental assemblymen will be suspended in the exercise of their official duties, only, when handed down custodial conviction and enforceable judgment of freedom and more than three years for fraudulent offences. Departmental Act of 2010. Political positions. Jaime Barron, former municipality mayor in Sucre, was suspended weeks after taking office. Accused of humiliation to peasants. Q. What vision is the framework law of autonomies? J.B.: Is an unconstitutional standard that does not respect the rights of the people. This Act violated election procedures. Q. to your perception what is the background of this law? J.B.: This law only seeks to overthrow the ‘oficialistas’. In all the places where this rule has been applied, opponents who are from MAS militancy have taken office. Q. what must you do to prevent more suspensions? J.B.: Articles 144 and 145 of this law should be repealed. The suspension made to me, was totally arbitrary with the sole purpose of install a ‘masista’. People should make respect their rights and lift their discomfort. Ernesto Suarez. Beni. The departmental Assembly of Beni, suspended surprisingly Governor Ernesto Suarez Sattori from his post last December 16 . Instead assumed Assemblyman of the revolutionary nationalist movement (MNR), Haysen Ribera, who was criticized for an alleged Alliance that would have made with the assemblymen of the MAS. Suarez, is accused for economic damage to the State, a supposedly irregular purchase of a motor of electric energy for the population of San Borja. Mario Cossio. Tarija. The departmental Legislative Assembly of Tarija, suspended Mario Cossío of the position, precisely [also] on December 16, 2010. Cossio is accused for economic damage to the State by Bs1.3 million in the Imbolsur case which relates to the provision of 2,990 tons of asphalt cement for the construction of a road, as denounced by the opponent, Fernando Barrientos from Podemos. Cossio, is in Paraguay, qualifying for asylum, after declaring to be a persecuted politician. Warnes. Nils Carmona, elected Mayor of Warnes and from the opposition, in April 2010, was accused of misappropriation of funds by the central Government. Suspended from Office unexpectedly, taking office from MAS, Mario Cronenbold. Buena Vista. The mayor elected Bladimir Chavez (Verdes), was suspended from Office by his councillors, product of the indictment of alleged carrying people in the April elections, under the crime of abuse of public goods. Mairana. The City Council of the municipality, suspended Roger Terceros of the charge of an offence facing of alleged misappropriation of funds, in a previous term of which he was elected, in April 2010. La Guardia. Jorge “Chichino” Morales, considered a Mayor, example in the country, was suspended for three months for the offence of abuse of influences, benefit by reason of the position, jolt, allegedly by support to his sister-in-law. San Matías. Mayor Carlos Velarde was suspended by the Council and the communities for the alleged crime of misappropriation of funds, regards the paving of an avenue with over pricing. San Buenaventura. David Carvajal, was suspended in the first instance by the City Council, but then finally resigned from the post. He was accused by the disappearance of 1,500 barrels of asphalt cement that delivered the governorate of La Paz to the town, but those never arrived. Bermejo. Delfor Burgos Aguirre, Mayor of this town, was suspended by the City Council three months after taken possession. He is accused by the improper appointment of authorities in his previous term. Potosí. Rene Joaquino, mayor elected in April 2010 was suspended from Office in August of the same year. He is processed by the prosecution for the offences of breach of duties and wasteful conduct on the purchase of used cars in 2006. Our democracy is in peril and sets up very bad precedents for years to come. This entry was posted in Beni, Bolivia, Business, Economics, Politics, Santa Cruz, Social Unrest and tagged bad politics, Carlos Velarde, David Carvajal, Delfor Burgos, democracy in peril, Ernesto Suarez, Hector Cartagena, Jaime Barrón, Jorge Morales, Mario Cossio, Nils Carmona, Rene Joaquino, Roger Terceros, Ruben Costas, Tarija, Victor Balderrama, Vladimir Chavez. Bookmark the permalink.